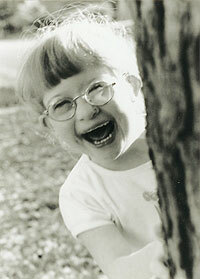 If I could choose only one word to sum up Gina, my daughter with Down syndrome, it would be “joy”! I know that it might sound strange to choose the word “joy” to describe a child with a disability, but I choose to focus on the joy she brings and not the fact that she has an extra chromosome which causes developmental delays. 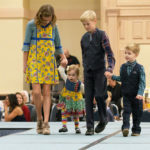 I have learned – better yet, my daughter has taught me—that taking a little longer to develop has some redeeming qualities and taking life at a slower pace has a lot to offer. It has been a valuable lesson that I might have never learned had it not been for Gina. Thinking back to the time of Gina’s birth, the day that we were confronted with the news she had Down syndrome, I have to be honest and say that “joy” was not my initial reaction. In the beginning I could not feel the joy this new child offered. I was filled with fear and sadness. I worried about the future, and my mind was flooded with questions. How would we manage? How would our family handle the news? What kind of financial burdens were in store for us? Would people make fun of her? Would she be able to go to school? There were so many unknowns. I was numb and confused. I felt as if there was a heavy blanket of fog lying on top of me. At the time, the weight of all this was crushing, and “joy” could not work its way to the surface. I wish that I could go back to the time of her birth and change the initial thoughts that came to my mind, but they were all part of the process of grieving for the child that I expected and the beginning of accepting the “joy” that was to come. I truly value the support that has come from those who have gone before me. The days that followed were full of cardiologists, geneticists, phone calls, research, and neonatal intensive care hospital visits. Life was a blur. We needed time to cope with the news. We brought her home, and it wasn’t long until the blanket of fog began slowly to dissipate. It was lifted by so many hands along the way, the hospital staff, doctors, wonderful caring friends and family. 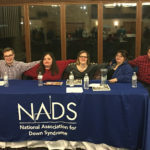 I learned about the valuable support from the National Association for Down Syndrome and began connecting with other parents of children with Down syndrome through their Parent Support Program. Being able to talk to someone who understood what I had experienced and knew the answers to so many of my questions was very comforting. They willingly shared their wisdom, taught me about early intervention, and showed me a wonderful community of support that was already in place. I have learned many life lessons, and I truly value the support that has come from those who have gone before me. I found my spot in that community and have learned to share, laugh, and love all the children with Down syndrome I have met. Those initial fears we had in the hospital room have come and gone. We have managed well, and the financial burdens are minimal. Our children, family, and friends handled the news just fine, and they celebrate each of our daughter’s accomplishments as if it were their own. At school she is supported in a regular classroom and has an incredible team that assists her to achieve her maximum potential. Most of all, she is accepted by the community. I have not experienced anyone making fun of her, and if they did, they wouldn’t be anyone I would care to know. In fact, many people say hello, call her by name, give her a thumbs up or a high five. I might add that many of these are people we have never been formally introduced to! She has been able to create her own identity, and her joy spreads beyond our family home. 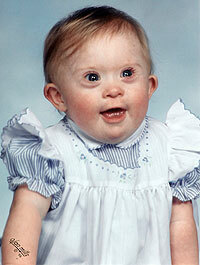 We cherish each moment she brings us, and life is a wonderful adventure, even with Down syndrome. We have learned that those initial fears were nothing compared to the love and “joy” that we have gained from her life!